Popular data visualization start-up Vizify has been acquired by Yahoo.The organization is now added to Yahoo to make its site more social. Marissa Mayer, CEO of Yahoo has acquired several start-ups to include useful technologies and also these acquisitions have acquired some talented staff members too to facilitates Yahoo operations and offerings more products in a better way.This acquisition of Vizify. Vizify basically offers users a way to create visualizations based on social-media driven data. According to a blog post, their goal is to transform “the information that we all consume and create every day into something more beautiful and personal." 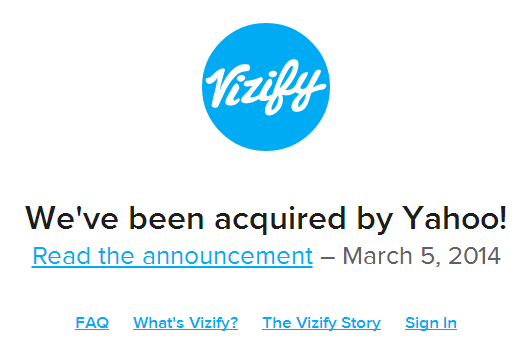 Vizify founded in 2011, will close its service as it transfers to Yahoo. So any new signups or purchases of paid plans will no longer be permitted henceforth. But the existing users who have already paid for a plan will receive a full refund while Premium customers who registered a domain through Vizify will be given instructions so they can assume ownership of their domain, free-of-charge. The existing users will have an option to “archive” a snapshot of their bio which will remain live at the same URL through 4th September. Marissa Mayer has acquired more than 20 small businesses in 2013 as well as six in the first two months of this year. Lets see how Yahoo proceeds further with this acquisition.